Once you start pricing carpet for your home you may begin to wonder, "Can you use carpet tiles to carpet stairs?" A do it yourself installation of carpet tiles is less expensive than having wall-to-wall carpet professionally installed, so the idea of placing carpet tile on stairs, too, seems like a great, cost effective plan. So, Can You Use Carpet Tiles to Carpet Stairs? Well, the answer is yes and no. In fact, there are adhesive carpet tile products designed specifically for use on staircases. The basic carpet squares you use for a room installation won't work very well, though. This is bad news if you have a few boxes of tiles leftover from an installation and are looking for a useful way to use them. If you want to cut your cost for carpeting by at least 20 percent and need to include carpet on your stairs into the bargain, though, stair carpet tiles are a good option. Match them when you buy standard carpet tiles, and you can often use the same installation methods for both. There's more good news here, too; carpet stair tiles don't need a pad or underlayment. You can install them with either an on-board adhesive strip or by "painting" a layer of adhesive on the stairs and pressing the tiles in place. You may need more than one tile for a tread, but once installed the seams will be completely invisible. No stretching is required, and you can trim the excess from the corners of the stairs with a utility knife. If the center of the tread gets dirty over time, remove just that section and replace it. It doesn't get much simpler or more convenient than that. 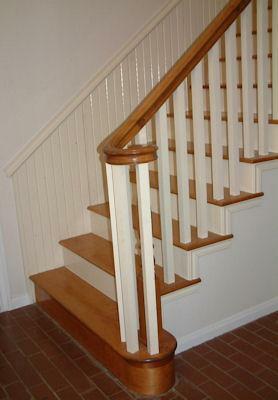 You can install stair tiles over plywood, concrete, wood, vinyl or linoleum. You can perform some complicated computations to come up with a general number of tiles for a stair installation, but the best method is to measure the height and width of your stair tread (the part you step on) and the riser (the vertical piece). Armed with that information, get the help you need from a qualified sales representative. There are a number of stair tiles sizes available, and what you really want is the best method and product for avoiding waste. Often this is a function of choosing the right sized tile and buying it in the right quantity. Currently, most tiles are sold in boxes of three to fifteen tiles. The good news is that if your home is relatively new the stairs are probably a standard size that'll be easy to accommodate. Stairs get dirty and this type of carpet lends itself well to changing out portions of carpet that wear unevenly or get soiled. To make this easier, buy extra tiles and make sure everything you buy is from the same dye lot. You'll usually see a stamped number next to the color and style numbers on the box that indicate the manufacturing run. Buy either heavy duty or indoor-outdoor carpet tile if you're using the tiles in an all-weather or heavy use area. Let the tiles come up to the temperature of the room for a day or two before you install. Always cut tiles on the wrong side (the back) with fresh blade in your utility knife. Do a mockup of the layout and grid your design before gluing tiles in place. The more precise your planning is, the more easily the whole project will come together. You have the answer to the question, "Can You Use Carpet Tiles to Carpet Stairs?" Now all you need is a free afternoon to perform the installation. It'll be less of a hassle than you think, and your home will feel warmer and look more welcoming with carpeted stairs.